It is a cellular component so scarce, some scientists even doubted its existence, and many others gave up searching for its molecular structure. Now a team led by researchers at Johns Hopkins has defined the protein structural composition of mitoKATP, a potassium channel in the mitochondria of the heart and other organs that is known to protect against tissue damage due to a heart attack or stroke. Importantly, the newly found channel strongly improves heart cell survival, demonstrating an essential life-saving role. In a report to be published in the journal Circulation Research online July 17, the O’Rourke group and colleagues from Portland State University in Oregon describe their successful efforts to pinpoint and identify mitoKATP, which is an opening, or “pore,” responsible for potassium uptake into mitochondria, the powerhouses of the heart cell. This particular potassium channel is a key player in the heart’s intrinsic ability to protect itself from a loss of blood flow, speeding recovery from heart attacks and preventing cell death and scar tissue formation. Unexpectedly, the protein structure of mitoKATP matched that of another, much more plentiful and well-known potassium channel in the kidney, called ROMK. Senior study investigator Brian O’Rourke, Ph.D., professor at the Johns Hopkins University School of Medicine’s Heart and Vascular Institute and director of the Bernard Laboratory of Fundamental Research in Preventive Cardiology, says the team’s discovery solves a 20-year mystery among cardiologists, physiologists and protein biochemists. Although there was abundant evidence that enhancing the ability of the mitochondria to take up potassium ions strongly protects against myocardial infarction, the channel behind this protective effect had escaped detection. Noting that other scientists had failed to pin down mitoKATP among other known heart potassium channels and mitochondrial proteins, the Hopkins team broadened the search for new, presumably unknown heart mitochondrial proteins. Using cow hearts, chosen because their large size offered more mitochondrial starting material, lead author and protein biochemist, D. Brian Foster, Ph.D., used mass spectrometry to identify 20 million peptide signatures that yielded over 900 potential mitochondrial proteins — only one of which stood out as a tantalizing candidate for mitoKATP. Surprisingly, this candidate, ROMK, was a channel known to be found in the kidney, but had never been previously detected in mitochondria. Foster and study co-lead investigator, Alice S. Ho, a Ph.D. candidate in biomedical engineering at Hopkins, then set up a series of experiments to determine if the mitochondrial version of ROMK (mitoROMK) was indeed a key component of mitoKATP and had similar heart protective qualities. Using cultured heart-derived cells, she showed that ROMK is localized to mitochondria. Next, Ho perfected an assay for mitoROMK activity, by monitoring mitochondrial uptake of thallium, which has a similar size and electrical charge as potassium. In cells in which mitoROMK was depleted, thallium uptake was decreased by more than 70 percent. Additional supporting evidence came from experiments using Tertiapin Q, a honeybee toxin known to block ROMK. Co-investigator Keith Garlid, M.D., and his research team in Oregon, employing a classic assay for mitoKATP, showed that treating mitochondria with Tertiapin Q potently inhibited potassium-dependent mitochondrial swelling. The honeybee toxin also inhibited mitoKATP activity using the thallium assay. A final set of experiments demonstrated mitoROMK’s protective effects in cells; increasing mitoROMK levels led to increased rat heart cell survival and less damage after exposure to increasing amounts of tert-butyl hydroperoxide, an oxidizing chemical that mimics heart attack, heart cells with depleted mitoROMK levels had a higher death rate with the same treatment. O’Rourke says this study provides the first molecular key to unlocking the pore structure of the cardioprotective mitoKATP channel. More work will be required to fully understand the role of mitoROMK in protecting against cell injury and death in intact animals and humans during heart disease. However, since mitoROMK is expressed in organs such as the brain and liver too, the work uncovers a new avenue for therapies targeting mitochondria and opens the door for discovering more potent and specific drugs that activate mitoKATP. Funding for the study was provided by the U.S. National Institutes of Health, specifically corresponding grant numbers P01-HL081427, R01-HL108917 and P01-HL36573. In addition to O’Rourke, Foster and Ho, other researchers involved in this study were Jasma Rucker, B.S., Ling Chen, M.S., Agnieszka Sidor, Ph.D all at Johns Hopkins; and Anders Garlid, B.Sc. and Keith Garlid, M.D., Ph.D., at Portland State University, in Oregon. The American Heart Association Council on Functional Genomics and Translational Biology recently released their list of “Top Advances in Functional Genomics and Translational Biology for 2011” and we are pleased to announce that PLoS ONE article “A mighty small heart: the cardiac proteome of adult Drosophila melanogaster”(1) is one of 10 featured publications! All 10 articles were summarized in a paper published in Circulation: Cardiovascular Genetics, published by the American Heart Association(2). The finalists were selected from hundreds of papers in the literature, with input from the Early Career Committee of the Council on Functional Genomics and Translational Biology. In this article, Cammarato and colleagues describe the full complement of proteins that exist in the adult Drosophila heart. The insect heart, also referred to as the dorsal vessel, is a simple pulsing tube that maintains the flow of haemolymph (ie. bug blood) through its open circulatory system (lower image and inset, shown with nearby abdominalmuscle). The haemolymph is not restricted to vessels — there are no veins and arteries — but instead bathes the tissues in one big internal cavity. Unlike our circulatory systems, the insect system has no role in delivering oxygen to tissues and cells, so the haemolymph contains no red blood cells. Similarly to our system, it does carry various immune cells and nutrients necessary for the health and function of the animal. Despite any differences, we have long known that many of the genes involved in making a fly heart are the same as those needed to make a mammalian heart. The authors of the PLoS ONE study carry out a comprehensive survey of proteins that make up the adult Drosophila heart. Importantly, they compared their results to those found by researchers that have examined adult mouse hearts, and the similarities they identified are astonishing. Essentially, the authors have paved the way for new studies that will use Drosophila in research of heart disease and its treatment. 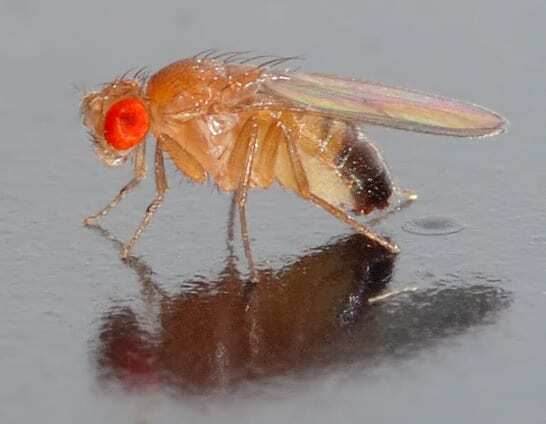 For decades, research in Drosophila has provided insight into various complex biomedical problems, and now we can turn to this model to fight the number one cause of death worldwide (3). We offer our heartfelt congratulations to Cammarato and colleagues, and we ask that you forgive the pun. 1. Cammarato A, …& Foster DB. (2011) PLoS ONE 6(4): e18497. We are deeply grateful for your support of the work we do at Johns Hopkins Heart & Vascular Institute. Your gift will enable us to make a difference in the world through our mission of discovery, education and service to all humanity.